Each screen entry in Zoom Commander represents a display device or a screen zone (a rectangular zone covering a sub-section of the display device's viewable area). The screen entry's name, used for display and identification. The Address (e.g. 'zpc.mypc.net') or IP number (e.g. '10.0.0.1') of the Windows PC running Zoom Presenter. To use Zoom Presenter and Zoom Commander on the same PC, set the address field to 'localhost'. Each instance of Zoom Presenter listens for Zoom Commander on an open TCP port. Port numbers can have a number value from 1000-65535. When using more than one Zoom Presenter instance on the same PC, it is recommended using Zoom Presenter INSTANCE manager to automatically execute Zoom Presenter with unique port numbers for each running instance. Simply copy the port number specified in Zoom Presenter INSTANCE manager into the port field of the 'Add screen' dialog. To manually specify the port number Zoom Presenter is listening on for a connection from Zoom Commander, without using the instance manager, see Zoom Presenter manual installation. By specifying a password in this dialog and in Zoom Presenter INSTANCE manager, the communication between the Zoom Presenter instance and Zoom Commander is encrypted, preventing 3rd parties from attempting to take control of the remote screen. The screen entry covers the display device's entire viewable area. Can be used in a Video Wall layout to cover multiple display devices or in Screen Zones configuration to cover a sub-section of the display device. Used in a Video Wall configuration to cover every accessible display device. Background zones sit in the background and ideally, one or more background zones should cover the entire display device's viewable area, otherwise the Windows desktop might peer-through. Floating Zones appear on top of background zones, enabling 'picture-in-picture' screen layouts. Invisible zones are useful when a separate audio track playback is required or when outputting multiple audio tracks to different output audio devices or wireless speakers. When the screen layout is set to fullscreen, the monitor drop-down list appears. When the PC running Zoom Presenter is connected to multiple display devices, Windows assigns each device a monitor number. Use this number to select the display device where the fullscreen media content should play. When the screen layout is set to 'custom position', the zone coordinate input boxes appear. Zone coordinates are used to specify a Video Wall or Screen zone layouts and represent the viewable area within Window's virtual-desktop. Zoom Commander supports the latest video rendering technologies. 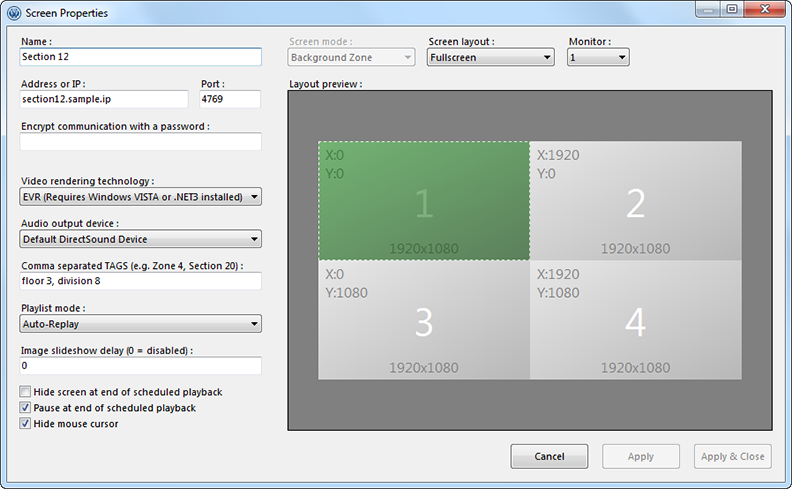 The video renderer is a component used to render video on-screen. Each video renderer component has some benefits and limitations depending on hardware and the version of Windows used. By default, Zoom Commander uses EVR9, which requires Windows VISTA or newer. To use Zoom Commander on older versions of Windows, the 'VMR9 Windowless' options is best. For the best video quality and smoothness on a high-end display card, MadVR is the best option, well suited for Video Wall configurations. Very old or very cheap hardware may only support the VMR7 video renderer. A PC may support multiple audio output devices and wireless speakers. Each screen zone entry can output audio to a separate audio device, enabling multi-room audio support or a background audio track. Each screen entry can be marked with one or more TAGs. Each TAG is later used to filter the screen list and perform linked actions concurrently on multiple screen entries. For more information on how TAGs are used, click here. This field specifies how Zoom Presenter should react when the entire playlist has finished playing. Image slideshow delay specifies the number of seconds used as the play length/duration of still images (JPG/PNG/etc). A value of "0" maintains the still image on-screen until the 'Next Track' button is clicked or a scheduled playback event is triggered. The Hide screen setting controls whether the video playback window automatically hides when there is no content scheduled for playback. For example, playing a training video or web based notification on an employee's computer and automatically hiding the visible content at a specified time. If enabled, when a scheduled playback entry reaches its end time, playback of the current media is paused. Otherwise, the last playing entry continues playing until the entire playlist completes and the "Playlist mode" setting takes effect. This setting controls whether the mouse cursor is visible when hovering over the screen zone's viewable area. If a screen is unable to connect, please review the Troubleshooting section.